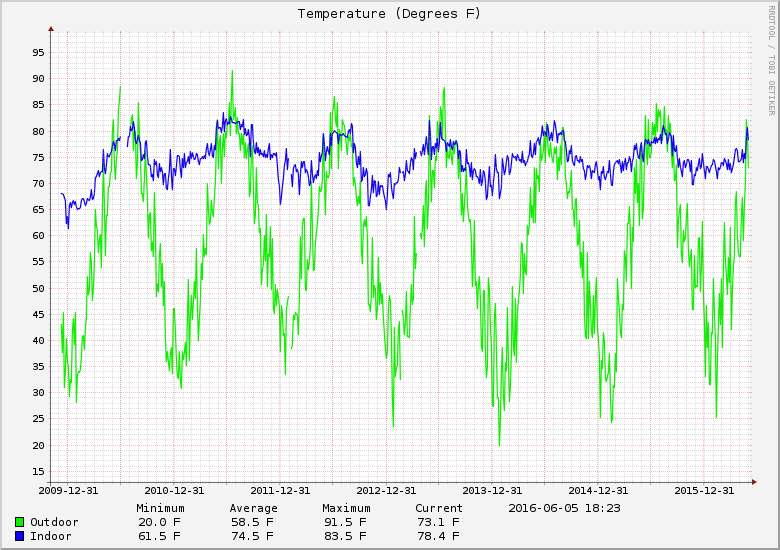 I've had computerized logging of temperature, indoor and outdoor, since I lived in my previous apartment. Both the heat and A/C there was electric, which I paid for. With a clunky old unit. So I hooked temperature sensors to the server I ran all day anyway, and put a relay in front of the HVAC unit to create a simple thermostat. It's fun information to have, so I've kept it. But they sensors are clunky wired units with some nasty quirks; for example on Friday it said the temperature inside remained exactly 77.1 degrees for about 20 hours straight. There are a couple spots that it will get "stuck" like that, and it limits the possibilities for me to lay things out (server + wire must reach out the window to keep outdoor data). I've meant for quite some time to build something better. 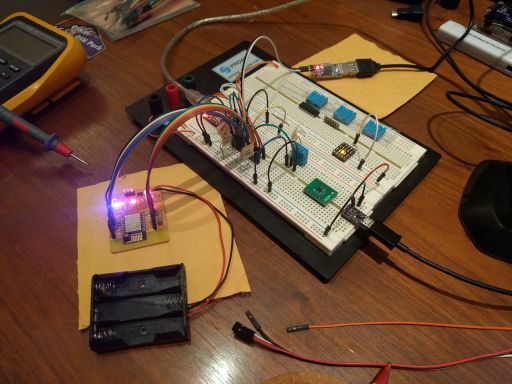 I have an esp8266 wireless unit bought on impulse lying around, at bottom left of the image besides this text. I've also got some DHT11 sensors I could hook up to it. Those are the little blue boxes in the top right, three in the tray they came in and one actively hooked up. And working! But the DHT11 turns out to be awful. It only gives 1 degree Celsius resolution, so about two degrees Fahrenheit; I'd prefer something like 0.1 degree F resolution. It also does humidity which is nice, but with similarly lackluster abilities. In my last electronics parts order I grabbed a few DS75 chips, which can do temperature to 0.0625°C resolution. It's sitting on the green board in the bottom right of the picture; next thing to do is to try to talk to it! Update, on the 6th: I've got the DS75 hooked up and working and I can indeed get my 0.1°F or so readings out of it. I know for sure because I can watch it heat up a bit as I touch it with my finger, and cool off when I let go.